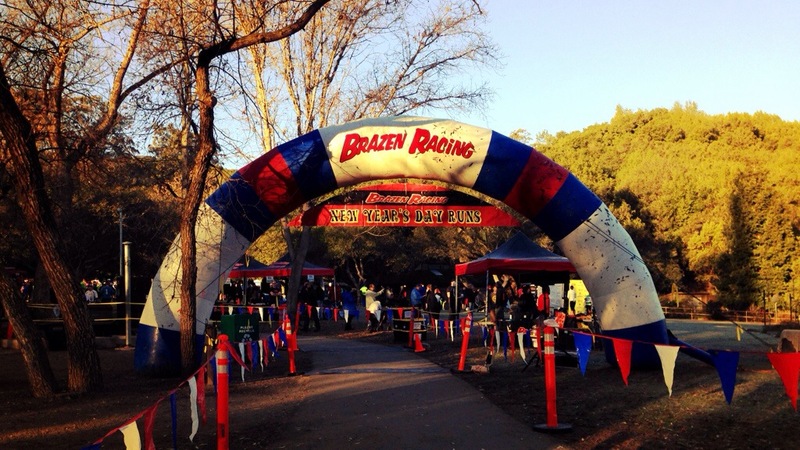 On January 1st, I ran Brazen Racing’s New Year’s Day Half Marathon in Castro Valley. This event was the partner for the New Year’s Eve (Almost) event (NYE) held on December 28. As with all Brazen events, this one had the usual distances to select from: a 5K, a 10K, and the half marathon (which also includes a hiker option for non-runners.) As with the NYE event, this one was sold out as well, boasting a great spread of finishers in each of the distance options: 455 in the 5K, 352 in the 10K, 26 in the half hiker division, and 362 in the half marathon run – for a whopping total of 1,195 people starting 2014 out right! The weather was great for a run and almost a repeat of the NYE event: a brisk 32 degrees at the start with partly cloudy skies and no wind to speak of. The clouds burned off and it probably warmed up to the low to low 50s by the time I finished. 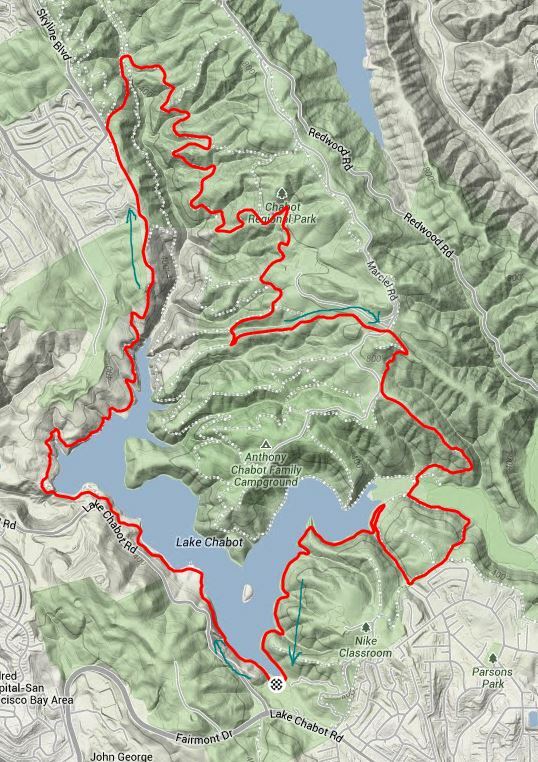 The New Year’s Day event is run on the same overall course as the New Year’s Even one, except that the half marathon course is run the opposite direction – or clockwise around Lake Chabot and through sections of Chabot Regional Park. As with the New Year’s Eve event, I ran this event last New Year’s Day, so I was familiar with the course already. The nice part is that the mondo hills on miles 2 to 4 from NYE are downhill and fast for this race…though there is still a fair amount of uphill on the balance of the course! As with NYE, course management, support, and the volunteers were AWESOME! For this race, I had the same race goals I did for NYE: Enjoy myself (run when I felt like it, walk when I needed to) and try to beat my time from last year. I did not intend to push myself too hard as I was just getting over a head cold and stayed up too late the night before! I followed the same schedule as NYE and got to Lake Chabot by 0700, hit the still-fresh pota potty, picked up my bib and shirt, then hung out in my warm car until about 0800. At about 0800, I went to the start area, hit the porta-potty again, milled around the crowd, and then lined up around the mid-pack area of the start corral. The start horn blew at 0830 and we were off. I stayed on pacing plan and took it easy…almost a little slower at first than NYE. I tried to run a bit slower on this race to see if I could walk less. In general, this was pretty successful, based on comparing the stats on Strava. That said, this direction is somewhat easier in my opinion. All that said, it was a fun one! As for carb loading, I’ll give myself a small e for effort. I had pancakes and spaghetti on 12/31, but New Year’s Eve was just too hard to focus on carbs. Oh well, not an “A” race, so I accepted that!! I did follow my usual race fueling plan: bagel and jelly at -3 hours, GU at -45 min, GU & salt tab at -15 minutes, and GUs and additional salt tabs along the way – plus 20 oz. electrolytes during the race. Equipment/Kit [head to toe]: Polar Reversible Buff (worn as a cap), tech shirt from the NYE half, Road Runner Sports arm sleeves, Garmin 910XT, tech touch knit gloves from Target (I’m secure enough to admit that they are women’s; but hey, they’re cheap and work! ), Amphipod Hydraform Handheld Pocket, ASICS 55 Shorts, CEP Compression Sleeves, Drymax Maximum Protection Trail Running socks, Hoka One One Stinson EVO trail shoes. The cool thing was that if people finished the NYE and this event, they received a third medal that formed a “MEGA-MEDAL” for the event duo (pictured below.) I think this is pretty nice – and Brazen’s medals are always cool anyway. Bottom line: Great race, though I only met one race goal: I had a nice run. I actually finished 21 second slower than my 2013 time. Post-race meal: As with the NYE event, after cooling down (and cleaning up slightly and changing into the race shirt I just earned in the parking lot), I headed back toward home and met my wife and mother-in-law for lunch at the same local diner. My feast: PANCAKES! Followed by potato skins, a salad, filet Mignon, baked potato, and part of a big mountain chocolate fudge cake at Black Angus later that evening.